Chinese stock investors react as they check the prices at a securities firm in Qingdao, Shandong province on June 19, 2015. On that day Shanghai shares plunged 6.42 percent. By Jiang Fei, Liu Caiping, and Yue Yu, Caixin staff reporters. This article was first published by Caixin. Top executives from 21 securities firms spent the morning of Saturday July 4 pinned to government office chairs while the future of China’s stock markets hung in the balance. They’d been summoned on a day off to the Beijing office of the China Securities Regulatory Commission (CSRC) for talks aimed at pulling the Shanghai and Shenzhen stock exchanges out of a three-week tailspin. The dramatic sell-off had pushed the Shanghai Composite Index, a gauge of A-share market performance, to 3,629 points on July 3 from a June 12 peak of 5,178. The CSRC said the index had fallen too far too fast, threatening the nation’s financial system. So the government decided to prop up share prices and ordered securities firms to get involved. In the early days of the sell-off, regulators were relieved to see the Shanghai index cool off. Share prices had been rising quickly since mid-2014, and the index hit a nearly eight-year high in early June. At a press conference on June 26, a CSRC spokesman called corrections necessary components for a stock market’s healthy, long-term development. But within a few days, the government’s attitude had swung the other way. The CSRC started preparing emergency measures to counteract the correction. And at the July 4 meeting, securities firms were enlisted to support the market intervention strategy. A person who attended the meeting but asked not to be named said the securities firms’ executives were told what to do—and that there would be no room for negotiating with regulators. After the sit-down, the firms announced in a joint statement that to stabilize the stock market they would spend at least 120 billion yuan ($19.3 billion) combined to buy exchange-traded funds linked to blue-chip stocks listed on the Shenzhen and Shanghai bourses. Moreover, the firms pledged to hold all stock that had been bought with their own money until the index reached at least 4,500 points. All money transfers from the firms were to be completed by 11 a.m. the following Monday (July 6), the person who attended the meeting said. The firms complied. Then on July 8, as part of the CSRC strategy, the CSF said it would set aside 260 billion yuan ($41.8 billion) to finance stock purchases by the 21 securities firms. The Chinese government’s stock market rescue campaign was under way, but far from over. By July 9, it was clear that all major, market-related agencies of the central government had decided to contribute to the stock exchange intervention effort. These included agencies that regulate the insurance and banking industries, the Ministry of Finance, and the State-owned Assets Supervision and Administration Commission (SASAC), which oversees major state-owned enterprises (SOEs). Even the Ministry of Public Security stepped in by pledging to help regulators hunt down any rules-breaking short-sellers who may have contributed to the sell-off. CSRC officials were strategizing like generals on a battlefield, people close to the commission said. Every afternoon, after that day’s stock trading had ended, CSRC Chairman Xiao Gang and other officials held a special meeting to discuss market conditions. A sense of urgency prevailed. Never before had the country’s stock markets taken such a wild ride, with the Shanghai index rising more than 3,000 points in less than a year. Amid the sharp ascent, retail investors had poured into the market, often with money borrowed from securities firms through margin trading schemes. Others got into the leverage game through so-called “umbrella trusts,” which funnel money to borrowing investors from bank-run wealth management products, peer-to-peer lenders, and asset management firms. The CSRC said that the value of all stocks held by traders who borrowed money from securities firms rose to more than 2.2 trillion yuan in June from about 400 billion yuan in July 2014. Estimates vary as to how much was held by investors who borrowed through other channels. Many suspect that the figure in early June was at least 2 trillion yuan. Critics of margin trading note that when stock prices fall, leveraged investors may be forced to dump shares to cover loans. A snowball effect can ensue, with leveraged investor sell-offs accelerating as prices slip. Margin trading warning bells started ringing at the CSRC in April, with officials determining that the leverage had gone too far. Regulators ordered securities firms to tighten margin trading rules and stop serving traders who had borrowed to buy stock through umbrella trusts and other channels. But leveraged trades continued, in part because securities firms apparently found a loophole through which they could continue handling stock trades for clients who borrowed money from umbrella trusts. The CSRC decided enough was enough on June 13 and issued an ultimatum: All securities firms were told to stop plugging umbrella trust borrowers into their lists of eligible stock traders. The order was issued on a Saturday, while the markets were closed. That Monday, soon after trading resumed, the sell-off began. As the Shanghai and Shenzhen indexes slumped, the CSRC stood its ground. In a statement on June 26, a Friday, it assured investors that closing loopholes in margin trading schemes would benefit the market and it would carry on. The next day, the central bank announced cuts to its benchmark interest rates and bank reserve-requirement ratios. Despite the rates cut, the market fell again on Monday, June 29. That night, CSRC had to soften its tone on margin trading and said the business still had room for growth. Investors responded by pushing the Shanghai index high the next day. But the nosedive resumed a day later. On July 1, the CSRC stepped in to prevent further declines by letting securities firms roll over margin trading contracts and loosening collateral requirements. It also said firms could issue and sell short-term corporate bonds and package their expected earnings from margin trading and short-selling into securities products that could be sold for cash. By giving securities firms access to more money to lend to stock investors, the regulator made a U-turn on margin trading policy. Nevertheless, the Shanghai index continued to fall. As part of the government’s next big intervention step, the CSF started buying stocks on the secondary market on July 6. On July 7 and 8 alone, the agency plowed at least 400 billion yuan into the market, people with knowledge of the moves said. Money used by the CSF to buy shares included the 120 billion yuan handed over by 21 securities firms on July 6, those sources said. The agency also borrowed from the central bank and commercial banks. In a statement released on July 8, the central bank promised to support the CSF with adequate liquidity. More intervention ensued. The Ministry of Finance promised not to sell any holdings in listed firms, and SASAC ordered SOEs to hold on to all their stock. Then the insurance regulator loosened rules governing investing by insurance firm by raising the percentage of premiums they can use to buy stock. The CSRC even bent the Securities Law and its own rules by encouraging a company’s major shareholders, directors, and senior executives to buy the firm’s shares under circumstances where the regulations say they should be punished. It also imposed a six-month ban on stock sales by them. Meanwhile, 1,442 companies had exercised their right to suspend trading of their own stock on the Shanghai and Shenzhen exchanges as of July 9. Many of these companies, which are among the 2,781 listed on the bourses, had seen their share prices fall sharply in the previous weeks. People close to the Shenzhen bourse said it received more than 130 requests to suspend trading from companies on July 7. The requests were approved, but the companies were told they could face scrutiny as only firms “working on really significant issues” are technically allowed to suspend trading, those sources said. Regulators also clamped down on futures trading and started looking for illegal short-sellers. 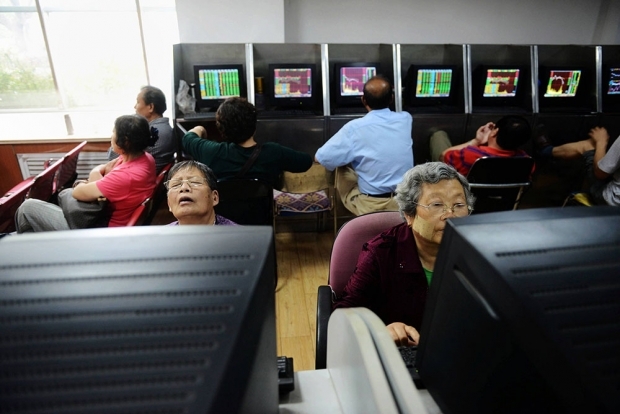 The CSRC and police announced a hunt for what they called “malicious” short-sellers. But as of mid-July, none had been identified. In late June, rumors cropped up that foreign short-sellers were sabotaging China’s market, prompting the China Financial Futures Exchange (CFFE) to refute those claims. Nevertheless, from July 3 to 8, the CFFE rolled out a series of measures aimed at discouraging short-selling. Transaction costs were raised and new restrictions were imposed on traders who take short positions. Critics of the CFFE clampdown said the agency actually put more pressure on the stock market because some investors deprived of access to index futures during the Shanghai slump decided to simply dump their holdings. The trader said he was not alone. “Everyone was paranoid and rushing to protect themselves,” he said. Shen Yi, a former Goldman Sachs trader who runs an investment firm in Shanghai, said the government should have focused on supporting the futures market rather than arranging for CSF to snap up stocks. “What the A-share market was experiencing was a liquidity crisis, not a financial crisis,” Shen said. But supporters of the government’s intervention have argued that the stock exchanges might crash if the Shanghai index falls too much, putting securities firms, banks, and investors at risk. They say the government acted prudently. Several bankers said that funds from bank-run wealth management products could be the next to lose if the Shanghai index fell below 3,200 because many investors who borrowed the funds will have lost all of their money. There is no consensus over how much bank money was at risk. Huatai Securities estimated that about 2.1 trillion yuan in bank wealth management capital was tied to the stock market, including 600 billion yuan channeled to leveraged investors through financial derivatives such as umbrella trusts. Some analysts see little reason to worry about potential losses tied to margin trading. Xu Gao, chief economist at Everbright Securities, said in a research report that non-performing bank loans would total 400 billion yuan and bad debt among securities firms clients would total 300 billion yuan if the Shanghai index were to fall to 2,000 points. Losses at these levels would be tolerable for the lenders, he said. At least in the short term, it appears the government efforts have worked. The Shanghai index jumped by 5.7 percent on July 9, closing at 3,709 points. The rally then continued for the next two days. Lu Zhengwei, chief economist at Industrial Securities, called government intervention necessary. Still, many experts have criticized the means by which regulators intervened. One fund manager said that many A-shares had been overvalued before the sell-off. He thinks the government should have waited a little longer to intervene, after prices fell to reasonable levels. Other critics questioned the wisdom of using central bank financing. “The central bank may have plenty of resources to help the capital market sail safely through a crisis, but these resources are publicly owned and ultimately paid for by taxpayers, so it must be extra discreet when using them,” a source close to the central bank said. The person added that the central bank did not run any stress tests that could have helped policymakers determine whether the stock market turmoil actually threatened institutions such as banks. “One big lesson from the market collapse is that the stock market does not have a proper short-selling system, and this is where the CSF should beef up its effort,” the analyst said. Some have argued that the CSRC violated its own market-reform policies and rules by ordering securities firms to buy stocks and telling company shareholders not to sell holdings. “The primary responsibility of regulators is to safeguard the spirit of the contract,” which is essential to the rule of law, said Wu Xiaoping, co-founder of a firm that helps stock investors borrow money.